Innovation helps police dogs keep the streets safe. Police officers and dogs have been crime-fighting partners for many years. 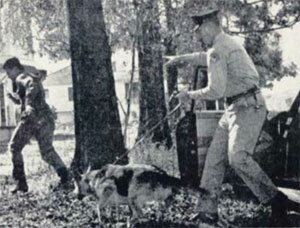 One early innovation in the partnership came when New Orleans police introduced the K-9 cycle, according to an article in the March 1962 issue of The American City. As New Orleans Sergeant Marvin Leonard explained, the department developed the new vehicles in response to a problem. After constant foot patrol in New Orleans’ muggy summer weather, police dogs’ paws became sore and they lost weight. Enter the K-9 cycle, sort of a motorized doggie cart. The department’s carpenter shop converted some three-wheel Harley-Davidson police cycles into first-class K-9 transport. The carpenters placed a wooden floor in the cycle’s trunk compartment, extended the rear bumper to make a step for its new canine passengers and even added a wind screen to protect the dog’s eyes. The motorized canine carriers, complete with sirens and two-way radio, provided the advantages of foot patrol without wearing out the dogs. Man and dog could respond to calls more quickly than if they were on foot. The vehicles could operate on sidewalks, in tight alleyways and other places inaccessible to police cars. “It has almost doubled the potential of the whole K-9 Corps,” Sergeant Leonard wrote. The K-9 cycles presented quite a spectacle with their striking canine passengers. Mind you, though, these were police dogs — meaning absolutely no petting allowed!